Reading blogs regularly is the best way to keep yourself updated to enrich your knowledge domain. And reading blogs is especially important for you if you are an educator to know what peers in the community are practicing. Because you are the one who can help your school kids to meet the digital age needs, the more you are informed, more you can contribute. Keeping oneself informed is not a very difficult task with the advent of technology. Today, we can connect our self with a lot of educational leaders who share their vision and knowledge via their educational leadership blogs (and obviously social media) to the teachers across the world. 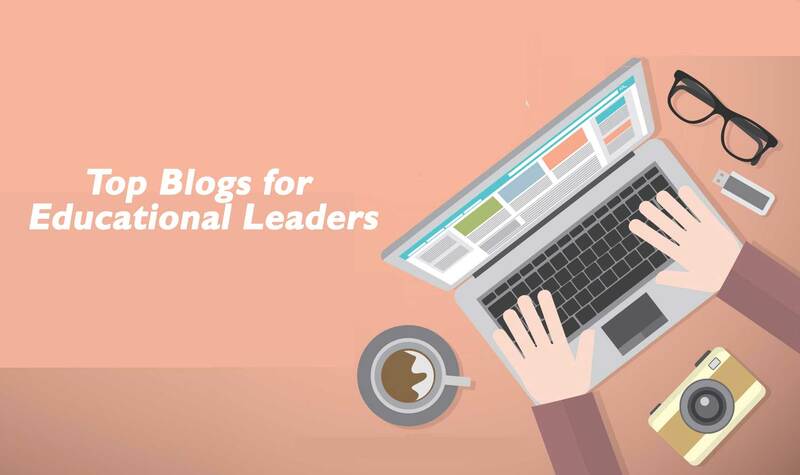 Today, I am sharing a list of blogs run by some great educators that every education leader must have. Cool Cat Teacher: Written by Vicki Davis, the blog works on the thought ‘a real teacher helping teachers be really excellent’. Cool Cat Teacher is a great place to find out free resources, books, tools, tips for beginner teachers on web, news related to happening of edtech industry and much more. So, I think, this among the best blogs which you should immediately bookmark. Angela Maiers Blog: As the name suggests, Angela Maiers is the owner of this blog. She writes to guide educators and organisation to harness the power of communication, social technologies and literacy, her write-ups will give you deep insight about various aspects of edtech. Eric Sheninger Blog: Eric Sheninger is an author of Digital Leadership Changing Paradigms for Changing Times, he is a senior fellow and Thought Leader on Digital Leadership. His educational leadership blogs will give you reflections on the role of a principal. Ozge Karaoglu Edublogs: This blog is run by English teacher Özge Karaoğlu. She is also a K4 technology specialist and an EFL teacher. The post contains essence of being a teacher, app and web tools. Tom.Murray: Insightful blog by Thomas C. Murray, serves as the Director of Innovation for Future Ready Schools, a project of the Alliance for Excellent Education, located in Washington, DC. The Principal of Change: The owner of this blog is George Couros and he is passionate about leadership in education. Here you can find many interesting post on education. Education Matters: Education Matters is an interesting blog where you can find many thoughtful posts related to education and education technology. Free Technology for Teachers: Well! This blog is among one of my favourite blogs because I find Richard Byrne ideas amazing. On this blog, you can find enormous information related to education technology. Information over here is divided into various categories such as Android 4 School, Practical Ed Tech, etc. Grin and BEAR "I.T. ": Jen Hegna post has really detailed post on various aspects of education technology. ASCD EDge: Steven Weber posts articles related to curriculum development, curriculum leadership, leadership in education teacher leaders, collaborative teams, unpacking standards, and student understanding. The Daring Librarian: Gwyneth Jones, aka The Daring Librarian, is a blogger, a Tweeter, an international speaker, a citizen of Social Media, and a resident of Second Life. Gwyneth is a Google Certified Teacher, DEN Star, an elected member of the ISTE Board of Directors, and the author of the award winning Daring Librarian blog. Jones was named a Visionary Leader by Teacher Librarian Magazine and a Mover & Shaker by Library Journal Magazine. Her work & writings have been featured in the New York Times, The Washington Post, and the Huffington Post. Admittedly, she’s also a goofball, a geek, and ridiculously humble. Adjusting Course: Brad Gustafson focuses on digital leadership and the 21st-century student. His digital challenge is a must see for principal and other leaders! Superintendent Bob: Bob Nelson writes about Leadership, Culture, Ed Tech, Rural Education. Dr Doug Green: Douglas Green curates the Internet for busy educators and parents who don't have as much time to read and surf as he does. The focus of his blog is learning, leadership, and social media. He also provides a daily quote and something fun. He summarizes important books to help with purchasing decisions and review.